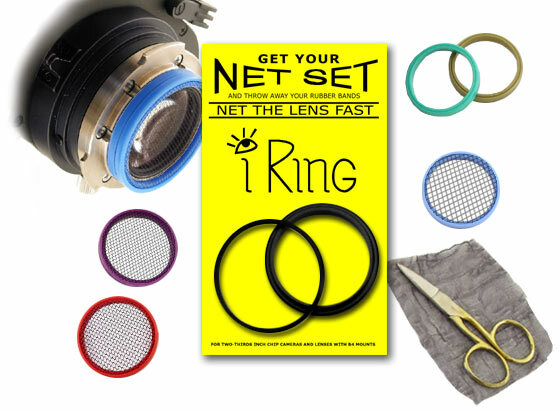 The i Ring is the fastest and easiest way to attach a net or stocking to a video lens for lens filtration. The i Ring consists of two interlocking rings that hold a stretched net in place. A netted i Ring slides onto the rear element of Fujinon, Canon, Zeiss, Optex and Angenieux video lenses. When the lens is mounted onto the camera, the i Ring holds the net in the light path. Rear element nets have many advantages over front element filters. The biggest advantage is the look. Video is often criticized for looking artificially edgy. Nothing adds creamy smoothness to a video image like a net. Nets softly flare light from lit areas to unlit areas across hard edges. This softens the effect of video edge enhancement giving your images a more film-like quality. Unlike front element filters the i Ring will never vignette at wide angles. Also, rear element nets leave the carefully coated front element of a lens uncovered. The front element lens coating is the best way to keep incidental light from clouding an image. Another advantage of the i Ring is speed. A netted i Ring can be attached to a lens in less than thirty seconds. You can net multiple i Rings with different density nets to create a filter set. This allows you to quickly and easily audition and choose the filter that is right for your shot. You can also use the i Ring to get an exact match when netting lenses for multicam shoots. Stretch one net and lock multiple rings. The i Ring can be used with virtually all B4 mount lenses and two-thirds inch chip DV, Beta, DigiBeta and High Definition cameras. Nets are very versatile in creating style. Shows as diverse as Survivor, Martha Stewart Living and Unsolved Mysteries all use the i Ring to help create individually distinctive looks. The i Ring is a powerful, inexpensive and versatile tool that can add a new dimension to your images. A variety of nets can be used with the i Ring on video lenses. They vary in density from a loose, light mesh to something as heavy as ribbon. Most of the time, nets are used for mild filtration. These nets range from bridal veil to silk or nylon stockings. Heavier materials can be used to create highly stylized images. Most DP's use black bridal veil although some prefer white. A variety of bridal veil and other netting materials can be purchased at fabric stores. 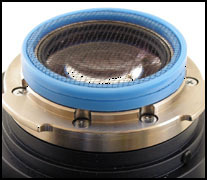 Bridal veil creates very light lens filtration with minimum halation. A thin loose mesh will provide the smoothest look. An "X" pattern may emanate from point sources. The orientation of the "X" will change as the net is rotated. For images with sources in the shot (especially when they are pointed toward the lens), bridal veil might be the only type of filtration that will produce acceptable results. Silk or nylon stockings are the most common netting with the sheerest being most popular. Most stocking manufacturers will mix Spandex® or Lycra® with nylon in order to make stockings more durable. However, this makes them too dense for our purposes. Check the contents to find stockings that are 100% nylon. They are usually labeled as "Ultra Sheer" or something similar. Stockings that are 100% silk also create beautiful filtration effects. Silk stockings are considerably more expensive than nylon. Very dense materials will create interesting effects. 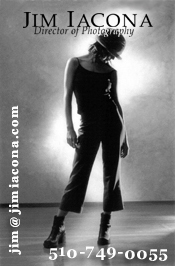 These may be applicable for flashbacks, dream sequences or other highly stylized shots. Woven materials that are reflective will produce exaggerated halation or vertical streaking that might be desirable in specific circumstances. Compatible with Ikegami HL 57 and Ikegami HL 59 cameras. Compatible with the full line of Zeiss DigiPrimes when used with two-thirds inch chip cameras with B4 mounts. Comaptible with all B3 Mount, two-thirds inch chip/tube cameras and lenses. Compatible with all B4 Mount, two-thirds inch chip Nikon lenses.